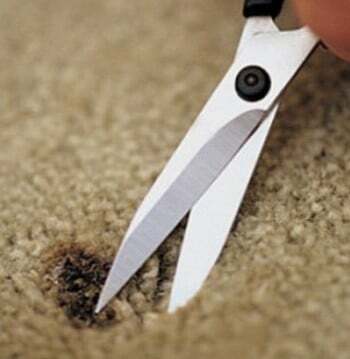 First, get a pair of sharp scissors and cut away all of the burnt area from the carpet. 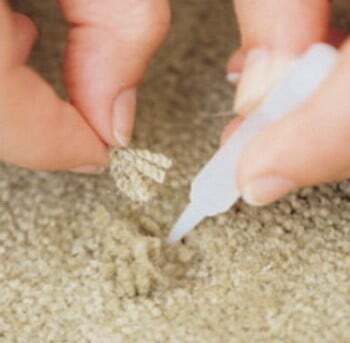 Don’t worry about removing lots of the carpet as you will be covering it up with new carpet strands. Get down deep to remove the “hard” burned pieces. Make sure every bit of the burnt and melted area is completely gone. Next go into a closet or area of your home (that has the same carpet) that is not seen or hidden. Take your scissors and cut the needed amount of carpet strands from the closet or other area. Cut the carpet strands as long as possible so they can be attached and hide the burnt area. Now apply the superglue in a very small amount to the bottom of the burn hole. Then, using a pair of tweezers or similar, grab the strands you just cut with the tweezers and put them in the burn hole. 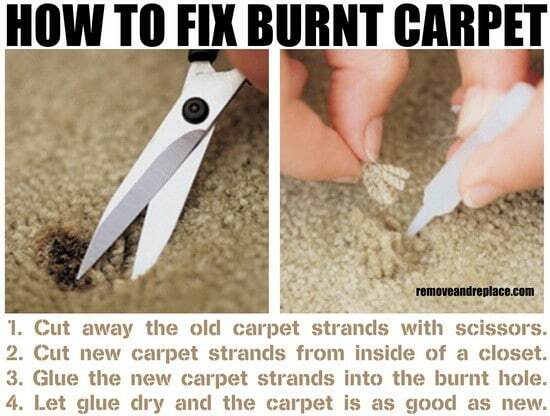 Make sure to put the carpet strands in the burned area and keep them so they are level with the top of the carpet. Hold them in place for about 20 seconds and let go. Now let the strands sit for a few minutes before walking on them. If you did this fix correctly, the carpet strands will be perfectly in place and you will not be able to tell there was ever a burn in the carpet! This easy repair method will work well with cigarette burns, an iron burn where someone has placed a hot iron on the carpet, and from a curling iron or similar. The secret to doing this repair is to cut the new carpet strands as long as possible and do not use excess amounts of super glue. If you know of a better method to repair or fix a carpet burn, please let us know below. Previous post: How To Easily Tell Which Direction You Are Standing N.S.E.W.